Even though Fast-Player promises to enable you to create playlists in the blink of an eye, we still do not recommend installing this program because it is a typical adware (advertising-supported application). Actually, it is not very likely that it will act as it promises, but if it does, you should still not keep Fast-Player because it will simply bombard you with commercial ads and will not do anything else. 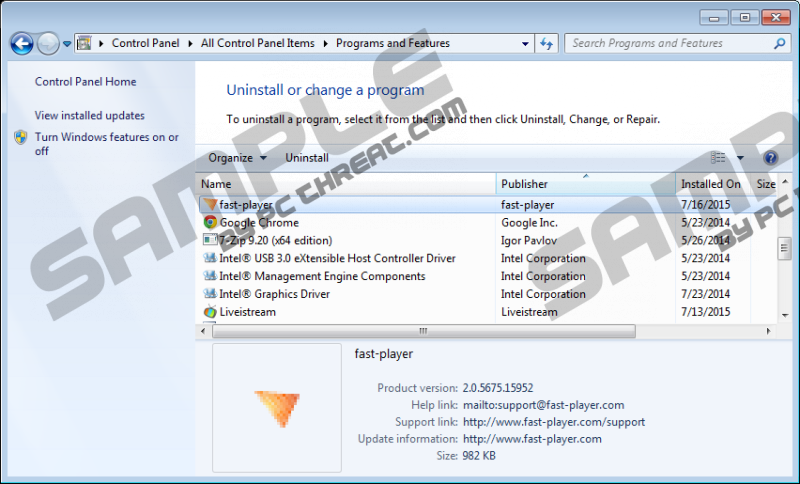 You will definitely find another program that will allow you to create playlists, so you should remove Fast-Player without further consideration. It is really important to delete this program because ads generated by this application might simply expose you to threats. You have to be very cautious in order not to allow other Injekt-based programs to slither onto your computer because they all act the same, i.e. show commercial ads. It is not surprising that they do that because they are adware. If you ever detect Assist Point, Positive Finds, Strong Signal, Roaming Rate, Dragon Branch, or Glass Bottle on your system, make sure that you erase them all as soon as possible. We recommend that you delete Fast-Player and other programs created on the Injekt platform because they will all show pop-ups, coupons, and shopping offers. In this sense, this family of adware programs is very similar to the adware that belong to the SuperWeb family. In other words, they show ads only. These ads might look interesting because they advertise various products and services, but you should still refrain yourself from clicking on them. It is very important not to do that if you do not want to end up on some kind of a corrupted website. The only way to stop Fast-Player from displaying ads is to remove it from the system completely. Follow our manual removal instructions step by step in order to eliminate it easily, or scan your system with antimalware scanner. If you have installed the SpyHunter antimalware suite, do not forget to keep it always enabled in order to protect your system from future threats that might want to enter your system secretly. You should always be more careful when surfing the Internet if you do not want to encounter malicious software. Select the program and click on it. Access the Metro UI menu and start typing Control Panel with your keyboard. Quick & tested solution for Fast-Player removal.